For the 57th La Biennale di Venezia I had the privilege of representing my country as part of an Official National Pavilion at the world’s oldest and largest stage for contemporary art. The event, lasting from Mid-May to late November 2017, saw hundreds of thousands of the world’s most attentive visitors as they came to this sort of “Olympics of Art”. The Grenada National Pavilion welcomed over 60,000 visitors who made their way away from the central Arsenale and Giardini to see and dialogue with Grenada and its contemporary art in this global conversation. I showed proudly along with fellow Grenadian artist, Milton Williams and our headliner for the pavilion, Jason deCaires Taylor who is world renowned, of Caribbean descent, and the creator of Grenada’s Under Water Sculpture park. Our offering of art on behalf of Grenada as a nation was noticed and commended by many international publications and we have been received warmly by the international art community. 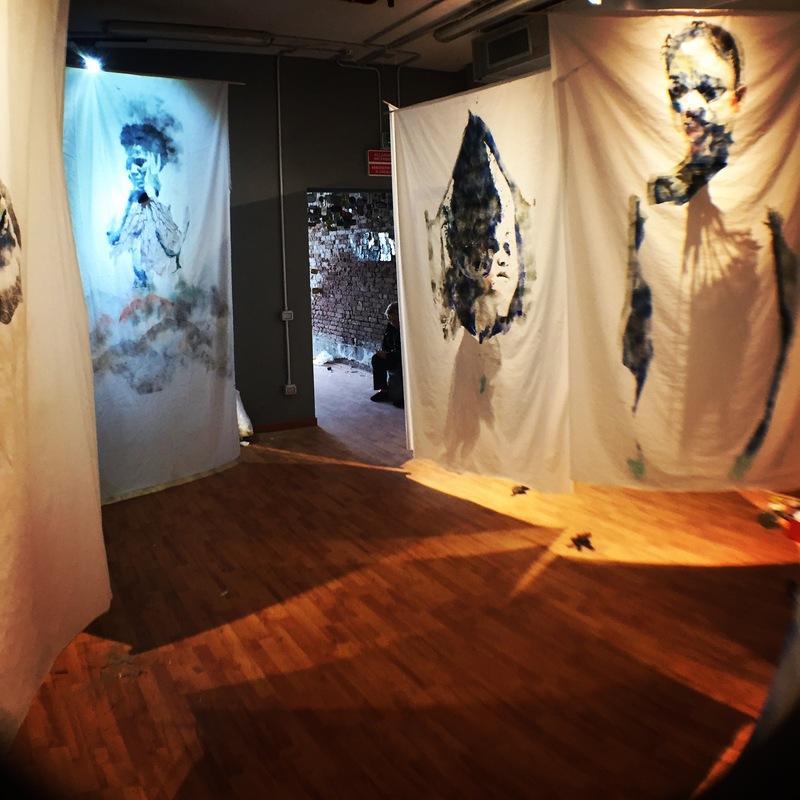 Sea Lungs, my installation of 8 pieces of sail cloth measuring 5’ x 8’ each with figures sprayed onto them and made complete with a sea fan to represent the figures lungs, were highly visible on social media and a visitor favourite. A lesser known fact about such high profile art events is that while it is an honour and a privilege and prestigious to show, it is also costly. The venue has to be rented for the 6 months as well as attendants (called guardians) to make sure it is open every day and to answer any questions visitors may have. With up to 500 visitors a day, our guardians were on their toes and we appreciate their multi-lingual abilities and interest in art! There are also regulatory costs to comply with Venice codes not to mention variables like getting literature printed, a banner in front of the pavilion, advertising in Venice, cost of equipment and equipment failure etc. This is all besides the cost of actually making the art and bringing it to Venice. 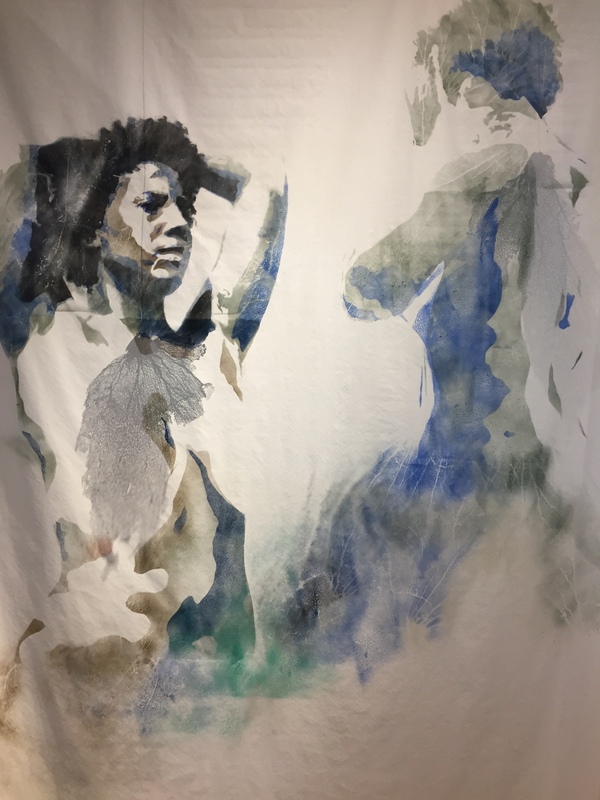 All of the sail cloth I used, spray paint, paper to cut stencils, time and energy cutting stencils, and “model appreciation” of course comes out of the artist’s pocket before they have to buy a plane ticket to Venice to show the work! All this to say – there is a lot of investment and I am grateful to the institutions in Grenada who contributed including Grenada Ministry of Tourism, Grenada Tourism Authority, National Lotteries Authority Grenada, Laluna Resort Grenada, ACT Art and Design Grenada, Art and Soul Gallery Grenada, Century 21 Grenada, Grenada Arts Council, Insurance Consultants Ltd. Grenada, as well as several individual contributors and a few international funders who made it possible! Grenada is the 11th smallest country in the world and appearing 2 consecutive times at the Venice Biennale is a feat matched only by it’s much larger Caribbean neighbour, Cuba. I personally feel a sense of this smallness as my personal income has not exceeded $11,000 USD a year in the last 6 years. We do not have institutions in Grenada for art such as museums or cultural agencies that ensure Grenada’s consistent involvement at the highest levels of cultural dialogue in the world. Everything we are doing at this stage is an investment and with intention to develop our own art scene as well as the art scene of the region. We are Davids in consult with Goliaths. Even the theme of the unified work of Williams, deCaires Taylor and myself deal with the very real and pertinent issue of our planet as David – the impact on our coral reefs as a result of varied environmental realities. My figures were posed as if to personify the reef responding to its own demise and then creating the correlation with the sea fan to remind us that our own breath begins in the sea and the life of the reef is correlated to our own life. In spite of the cost and investment involved in showing in Venice, our artists still drew humble attention to the reality affecting our marine ecosystems, showing a form of activism through art at the highest level that it could be consumed. All of this is what makes it sting that at the end of the Venice Biennale, Sea Lungs is missing. While reflecting on it, maybe this is a bad omen for the state of our reefs that the work that was created as a symbol of the reef would disappear like our reefs if nothing changes. I had multiple people who were responsible for packing up the art and returning it home to Grenada but when they arrived to the locked pavilion the work was not there. I would not have been able to afford to travel to Venice myself and so I relied on locks, keys, and agents to secure my work. Aside from any monetary value that the work may have, (sale of work is not typical or expected at the Venice Biennale), I am missing the hours of labor that depicted these figures, many of them people I grew up with, and the actual art work that I would not be able to propose to any more shows or exhibits. Regardless, Sea Lungs represents critical work in the art history of Grenada and the region and no one is sure if it is in a basement, the bottom of a canal in Venice or staged to sell at an art fair to an unaware buyer. My hope is that we can get to the bottom of this art heist because while it is a personal loss it also feels like a fight against something greater. We are fighting for the Davids of the art world to continue to exhibit and create waves. We are fighting for awareness and personal/corporate responsibility as far as the life of the reef and marine ecosystems. One of the most apparent fights is to encourage young artists to continue to strive towards greatness in their field, artist or not, without the fear that their work will go missing or plagiarised or any number of professional deplorable reactions. What has not gone missing from me as an artist is the ability to continue to work, continue to question and to imagine a better way for the world to be. While I originally directed the models in Sea Lungs to pose as if they are going through the 5 stages of grief, looking at the images of the work now they look like they are longing. These are faces I recognise and materials I know and when I look at them now, they look like they want to come home. 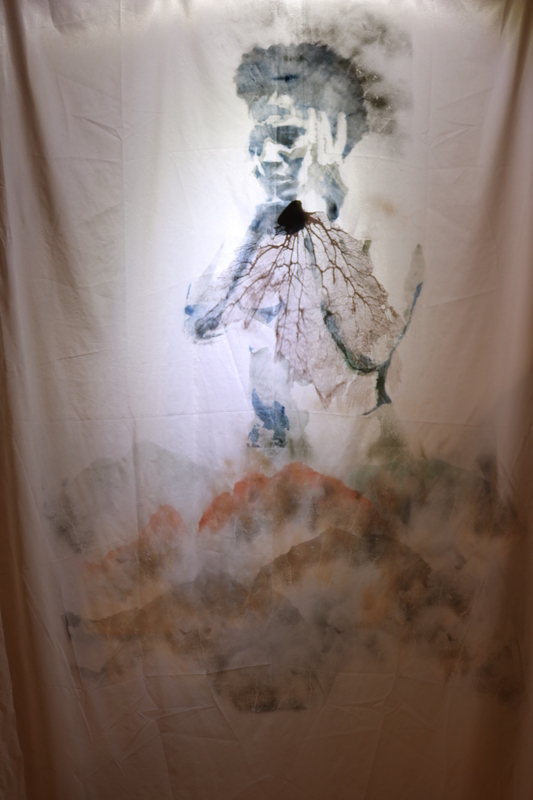 Sea Lungs consists of 8 paintings on sail cloth or ripstop measuring approx. 5 feet by 8 feet. Each figure has a corresponding sea fan to represent the lungs of each figure. Sea Lungs was last seen on Nov. 14th in the Grenada National Pavilion at 417 Dorsoduro, Venice close to the Zattere vaporetto stop. We are clear that this is not the fault or liability of La Biennale di Venezia or our hard-working and professional guardians. If you have any information leading to the reclamation of the work please contact me at ashermains@gmail.com. 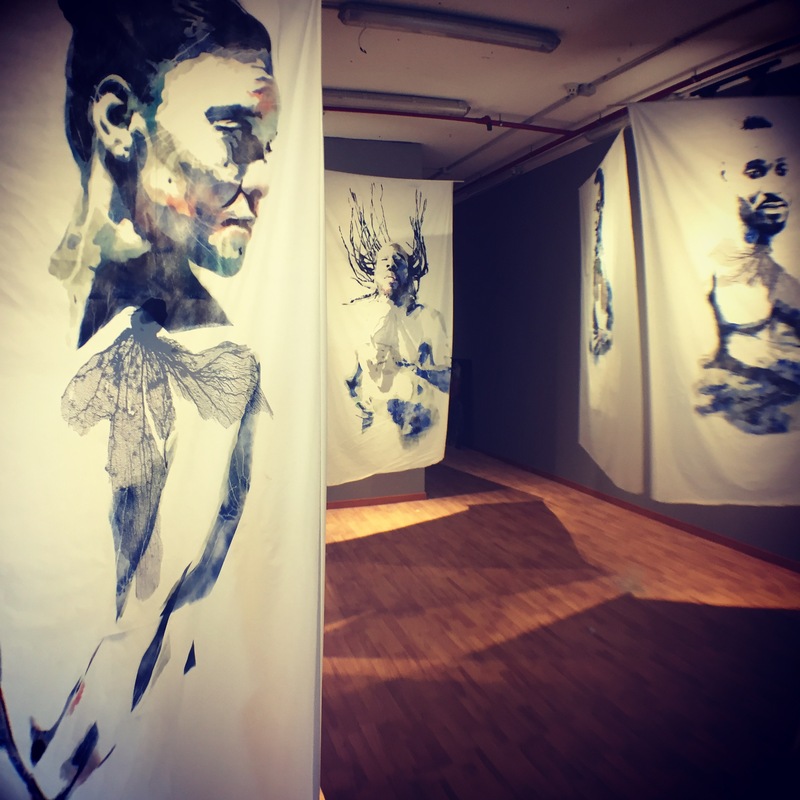 Below is a gallery consisting of each piece of the installation.